pssst, today is October 17th. Personally, what I think will help cure gun violence is witnesses actually pointing out to the cops who committed the crime but. 2) They're afraid (and possibly rightfully so) of retaliation. So there will probably not be much accomplished by the citizens to help lower crime which will leave it all up to the cops. It's sort of like parents who don't make sure their kids do homework and expect teachers to make sure their kids learn. Ending the norms against Snitching isn't going to be easy. ...the norms exist whenever and where ever one has more to lose from snitching than one has to gain. 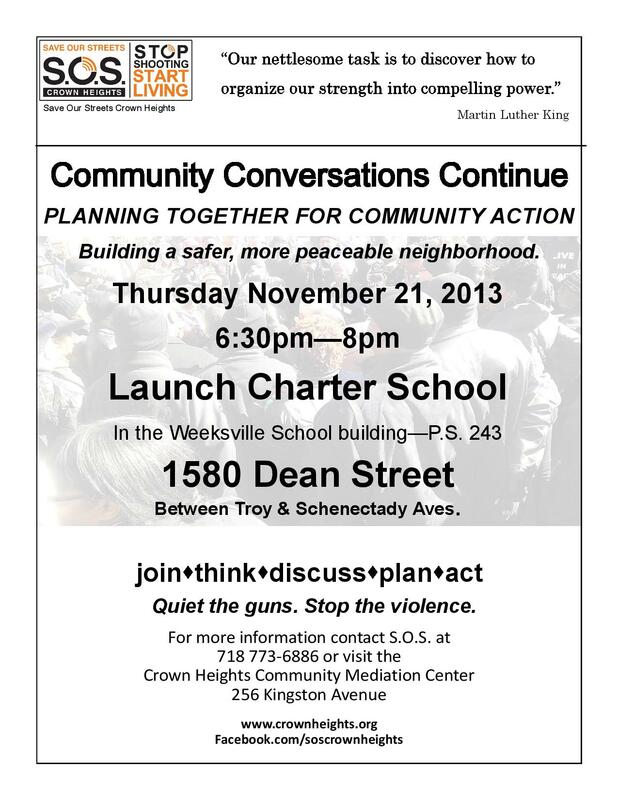 Please join us on November 21st, when we reconvene for session two of Community Conversations to continue the discussion and consider some of the ways that we can act to reduce the violence in Crown Heights. 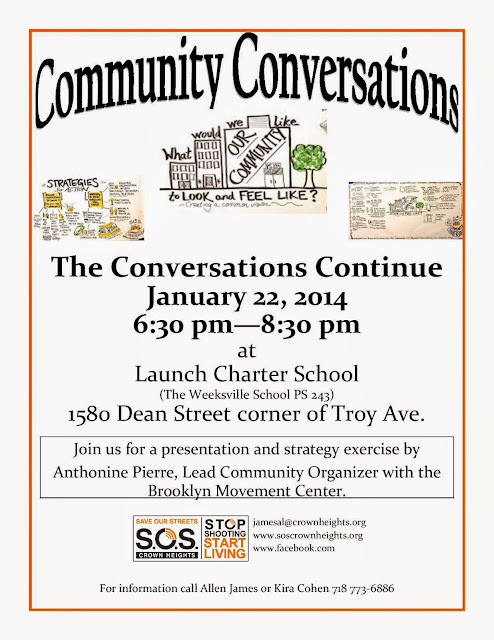 The dialogue will take place at 6:30 pm at Launch Charter School, on 1580 Dean Street. Under Sources there is one titled "Stressed Families and Fractured Communities". Seems like it may encompass some of what you are seeing. I saw that but fractured communities implies more of a "it takes a village..." deal and stressed families to me means that there are problems that the parents are having a hard time coping with. But, that's just my opinion. If they used the term "Broken Families", it might imply that single mother headed families caused violence. ....needless to say, this is about way more than not having a dad. Thanks for the video whynot! So interesting to see the comparisons between homicide maps and disease maps. Also, very relevant to think through this lens as we enter flu season! 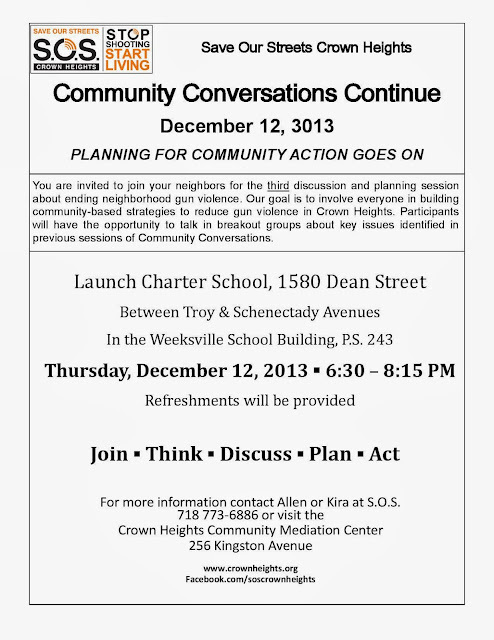 The next Neighborhood Conversation is November 21st. Whites were more likely to be victims of grand larceny and petit larceny than other racial groups. Was anything resolved last night? Or was it useless since the people committing the violence usually don't show up. Pardon me for being cynical. People who showed up looking for resolution were likely disappointed. Those who showed up looking to meet people whom hold similar views on the long term causes and solutions will likely be back for Session 3. I find it interesting to meet people who have been working on the issue for decades. To paraphrase a MTA bus driver I once talked with: "We will have jobs until nobody needs to get anywhere, and everyone is where they need to go". I will say that the people who show up for these meetings have more faith and hope that violence can be lessened than I do. I wish them well. BTW, there was a shooting on December 6th, near Sr. Johns Pl and Utica Avenue. Two men were shot and are expected to survive their wounds. Today, (Dec 7th) S.O.S. staff and S.O.S. volunteers held a rally in response to the shooting. Around 2:40 am this morning, there was a shooting in front of 1119 Prospect Place, between Albany and Kingston Aves. A 28-year old male was wounded and taken to Kings County Hospital where he was admitted. S.O.S. Crown Heights is organizing a community rally TOMORROW to express our collective opposition to this act of violence in our neighborhood during the season of peace. Even though - perhaps because - it is Christmas Eve, we hope you will join us for 30 minutes to stand against violence. A shooting occurred at St. Johns and Schenectady in the early AM of Jan 1. According to DNA Info, the 47 rookie cops who just joined the 77th precinct have allowed the Impact Zone in that area to be extended. It'll now go from Utica to Ralph between Sterling and Eastern Parkway, plus Lincoln Terrace Park. Hopefully that'll help. The 77th Precinct plans to beef up its presence in Crown Heights hotspots with 47 new officers. Lately there has been a lot of drug activity and violence on St. Johns, near Utica....as well as on Lincoln, near Utica.Given the rising property values in the area, I expect the police officers working the Impact Zone to be told to be very "assertive". Rescheduled to Wednesday, January 29th. 6:30 pm.Same location. Undercover officers bought cocaine, heroin and alprazolam, the generic form of Xanax, from the dealers 120 times between January 2013 and 2014, according to a statement by the Kings County District Attorney's Office. The local drug crew, which called itself "Sterling World," allegedly sold drugs in the lobbies and walkways along Sterling Place between Utica and Rochester avenues, near M.S. 394, a middle school. On March 10, there there was a shooting at Albany and St. Marks. A 17-year-old was shot and is expected to recover. No problem. As you are likely aware, the neighborhood has the most violence in the summer. Above in this thread, you mentioned that you feel a big part of the problem stems from the involvement level of parents. You are not alone. Local Clergy (known as the "Clergy Action Network") are taking the lead on a future event. However, some youth avoid anything that has anything to do with religion. What if we bring in Medger Evers College and DYCD as sponsors? Will this cause more youth to attend? ...I think I'll use this thread to document the summer's shootings in the 77th Pct, no matter where they occur within the pct. Fatalities and/or incidents in which multiple people are shot will likely get their own threads. I wonder how many of these shootings are the result of the pushing out of criminal activities from western CH to eastern CH, and the consequent territorial battles. My recollection from a few years ago was that a lot of the guys selling drugs on Franklin and Nostrand had already been pushed out of the neighborhood and were coming from ENY and Brownsville to sell drugs as the trade was already firmly established in the areas they moved to. I think this is just the usual summertime old heads/young bloods battles. In the May 29th incident, the deceased is rumored to have beat up a guy who then returned a day later to kill him. Unless we are allowed to choose "revenge" as a reason, I guess we'd have to assign a cause to the beating up part. Why can't revenge be the reason? I think that's probably the number one reason for shootings in NY, just ahead of "I hate him/her" and "S/he got what s/he deserved". How about "poor conflict resolution skills" as a reason? ...but when you think about it, if there is a murder, the conflict between the deceased and killer will never occur again. Using that lens, the conflict was resolved "well". Monday June 9,2014 approximately 3:30pm Prospect Place(Albany Avenue to Kingston Avenue). Victim: Male, black, 21 years old was shot once in the left arm and treated at Kings County Hospital for his injuries. The victim is listed in stable condition and in police custody for an active Criminal Court Warrant. Perpetrator- fled the scene in an unknown direction. THIS CASE IS CURRENTLY UNDER INVESTIGATION WITH THE 77TH PRECINCT DETECTIVE SQUAD. ANY INFORMATION THAT CAN LEAD TO THE ARREST OF THE PERSON RESPONSIBLE FOR THE SHOOTING. PLEASE CONTACT THE 77TH PRECINCT DETECTIVE SQUAD 718-735-0662, COMMUNITY AFFAIRS 718-735-0634, OR THE CRIME STOPPERS PROGRAM 1800-577-TIPS(OFFERS A REWARD UO TO $2000 FOR ANONYMOUS INFORMATION THAT CAN LEAD TO THE ARREST AND INDICTMENT OF A VIOLENT FELON). Wednesday's response to Monday's shooting. The crowd filled in some after this pic, and Councilman Cornegy made an appearance. Don't know what he will or can do about gun violence in the area, but glad to know at least his attention is on it.
" In the three other incidents, two men and one woman were shot in the legs, officers said. One of these victims was shot at a barbecue on St. Johns Place between Washington and Classon avenues, police said." None of these incidences are mentioned above, but all seem to have occurred on approximately June 16th. Anyone want to take bets on whether we will be getting an Impact Zone, or something that isn't called an Impact Zone but quacks like one and looks like one? One person killed, two injured. Monday, June 23,2014 at approximately 11:11pm inside of the Lincoln Terrace Park Basketball Courts(Buffalo Ave - East New York Ave). Victim #1- Male, Black, 18 years old was stabbed in the left side of his chest and removed from the scene via EMS to Kings County Hospital, where he was pronounced dead shortly after arrival. Victim #2- Male, Black, 17 years old was stabbed in the right arm and removed from the scene via EMS to Kings County Hospital, where he was treated for his injuries and listed in stable condition. Victim #3- Male, Black, 20 years old was stabbed in the left leg and removed from the scene via EMS to Kings County Hospital, where he was treated for his injuries and listed in stable condition. PERPETRATORS- UNKNOWN MALES, BLACK, UNKNOWN AGES AND UNKNOWN MOTIVE FOR THE STABBINGS. FLED THE LOCATION IN AN UNKNOWN DIRECTION. THANK YOU FOR YOUR SUPPORT & COOPERATION!! The NYPD mobile command center arrives. Good. I hope it helps with curbing some of the remaining criminal activity on Nostrand. Is the Mobile Command center going to be around for a while? I think that's up to the NYPD. Meanwhile, the event that was scheduled for June 20th (see above) is now to take place on June 30th. Thankfully, the event counts mostly on attendance generated from passing out flyers to select audiences ....and NOT my posts on Brooklynian. The 77th Precinct would like to notify you about an Arrest affected today by the 77th Precinct Detective and Brooklyn North Homicide Squads in connection to the three people stabbed that resulted in a Homicide previously reported as occuring on Monday June 23,2014 at approximately11:11pm inside Lincoln Terrace Park. Victim- Male, black, 23 years old was shot twice to the neck and once to the right thigh. The victim was removed to Kings County Hospital and is listed in stable condition. Perpetrator- Unknown, fled the loaction in an unknown direction. 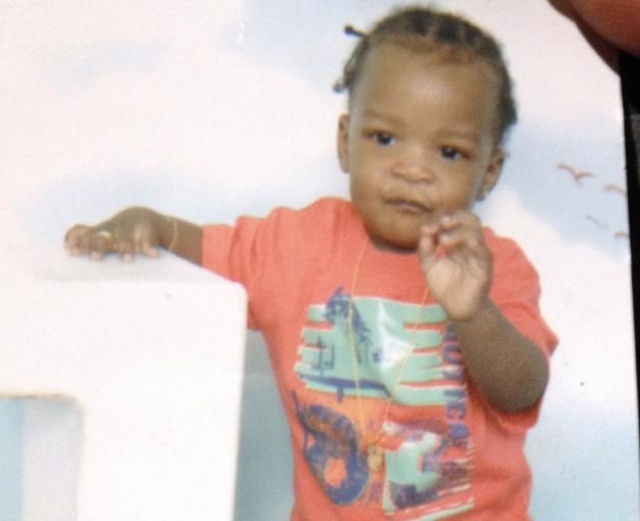 ***THIS CASE IS CURRENTLY UNDER INVESTIGATION WITH THE 77TH PRECINCT DETECTIVE SQUAD. ANY INFORMATION THAT CAN LEAD TO THE ARREST OF THE PERSON RESPONSIBLE FOR THE SHOOTING. PLEASE CONTACT THE 77TH PRECINCT DETECTIVE SQUAD 718-735-0662, COMMUNITY AFFAIRS 718-735-0634, OR THE CRIME STOPPERS PROGRAM 1800-577-TIPS(OFFERS A REWARD UP TO $2000 FOR ANONYMOUS INFORMATION THAT CAN LEAD TO THE ARREST AND INDICTMENT OF A VIOLENT FELON). "On Friday, 06/13/2014 within 1333 Prospect Place, the New York City Police Department’s Narcotics Division executed a search warrant that resulted in three(3) arrest, and the seizure of two (2) firearms and eight (8) ounces of marijuana . In addition, on 06/24/2014, within 1342 Saint Johns Place , the Narcotics Division executed a search warrant that resulted two (2) arrest, and the seizure of (3) firearms, 3.5 ounces of marijuana, and a sum of U.S. currency. The occupants of the aforementioned locations were responsible for daily, illegal drug activity affecting the quality of life for Crown Heights community residents. The Police continually need your help in keeping your neighborhood safe from gun violence, and free of drug dealers." On Thursday, July 3,2014, at approximately 7:44 PM in front of 1589 Prospect Place( Ralph Avenue- Buffalo Avenue). Victim: Male, Black, 19 years old was found shot once in the left armpit. He was removed to Brookdale Hospital for treatment of his injury via EMS and pronounced dead shortly after arriving. Perpetrator- Unknown and fled the location in an unknown direction. Brooklyn: Prospect Place & Ralph Ave Crime scene being established in regards to 2 people shot, 1 Aided in serious condition. Sunday, July 6,2014 at approximately 2:00am in front of 959 St. Marks Avenue (Albany Avenue-Kingston Avenue). Police Officers responded to a call of shots fired. Upon arrival they observed, pursued and arrested a M/B/21 years old in possession of a loaded .45 caliber semi-automatic firearm in front of 959 St Marks Avenue . Subsequent to the arrest a bicycle was thrown down from the fifth floor balcony of 959 St. Marks Avenue, striking four (4) Officers who were there to assist in the arrest. The Officers were taken to Kings County Hospital via EMS for treatment of multiple serious injuries. Consequently several arrest were affected at 959 St. Marks Avenue. Including the arrest of the individual responsible for throwing the bike at the Officers. "Sunday, July 6,2014 at approximately 1:15pm, Schenectady Avenue & Sterling Place. Victim- Male, Black,31 years old was shot once in his left Arm(Bicep).The victim was transported to Kings County Hospital via EMS for treatment of his injury.The victim is in stable condition. Perpetrator- Unknown, fled the location in an unknown direction." ...the two groups share many goals. A male has been shot at 177 Troy Ave, near Park Place. Crime scene being established. EMS on scene. The July 11th incident resulted in two people being wounded, one in serious condition. A community gathering is being led by SOS Crown Heights at 7 PM tonight (July 14), and the corner of Albany Ave and Prospect Place. We seem to have had a relatively quiet weekend in the 77th Pct. Last night around 9 PM, a male seems to have been shot on Sterling, near Rochester Ave. 1506 Sterling Place. He was reportedly alive when the ambulance arrived, and taken to the hospital. Fatal stabbing, Troy and Park Place. 1639 Street Marks Ave (out by Ralph Avenue). Active Crime scene established in regards to a male shot, Aided transported by EMS to hospital. Thankfully, muggings in which a gun is used do not usually result in gunfire. In a email that the 77th pct sent out today, the DA has announced a successful indictment. whynot_31, where do you find the police information you have posted above? If you email Tania Salters, she will send you the 77th pct newsletter and notifications of large incidents (such as shootings in which the person is killed or in serious condition). She usually sends them out within a week of the incident. They usually post crimes in which a person was shot within 30 min of the incident.